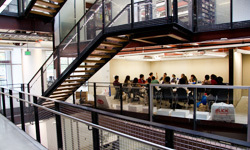 Drexel University’s Westphal College of Media Arts & Design is dedicated to the enrichment of society through creative practices in the arts, design, and media. Westphal contains one of the broadest ranges of creative programs housed in a single college in the country, representing an unmatched depth of expertise and skill that its faculty, students, and staff can bring to bear on virtually any challenge. We’re ranked among the top five Best Design & Applied Arts Colleges in the U.S. by College Factual, meaning students graduate with intensive studio experience under their belt, and with the highest chance of success in their careers in media arts or design. Eight of our individual programs earn national or international rankings, and we are recognized for world-class training in competitive creative fields like Fashion Design,Digital Media, and Entertainment & Arts Management. Eight of Westphal’s programs enjoy national or international rankings, including Entertainment & Arts Management, Graphic Design, Fashion Design, Design & Merchandising, Game Design & Production, Interior Design, Music Industry, Product Design, and Graduate Digital Media. Drexel’s Westphal College of Media Arts & Design is ranked #14 among the Top Fashion Schools in the world for undergraduate programs in Fashion Design and Design & Merchandising, and graduate programs in Fashion Design and Retail & Merchandising. 2018 Best Bachelor’s Entertainment Management Degrees in the U.S. Consistently ranked among the top media arts and design schools in the nation and across the globe, the Westphal College is recognized for our unique interdisciplinary approach to applied arts, our hands-on studio curriculum, and our graduation success rate. 93% of Westphal graduates are gainfully employed or enrolled in graduate or professional education within a year of graduation. Learn more about the Westphal College and our accreditation, as well as the innovative and hands-on opportunities available in our undergraduate programs, graduate programs, and accelerated degrees.